When Fannypack and I were deciding where to go for our next vacation, I had already forcefully told her that it would be an eating trip for me, therefore we should go somewhere with good food. Hitman and I had previously discussed whether any Korean restaurants here serve sannakji (live octopus)…and after conferring with my Korean coworker, it didn’t seem so although Hitman heard a rumour of a place that supposedly serves it in North Van. Therefore, I suggested to Fannypack that we should go to Korea to try that out!! And that became the basis of our decision to go to Korea. 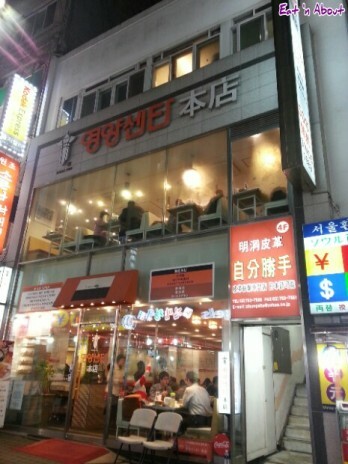 We stayed at Myeongdong, really close to Myeongdong Station. We had sannaki planned for another day. Tonight, it’s ginseng time!!! Unfortunately we had a 3 hour delay on the plane so we ended in Myeongdong at around dinner time. It was very cold that night, so after we dropped off our luggage, we quickly headed back out to eat. We referred to our self-guided tour book and decided that our first meal would be at the YongYang Centre, which translates to “Nutritional Centre”. 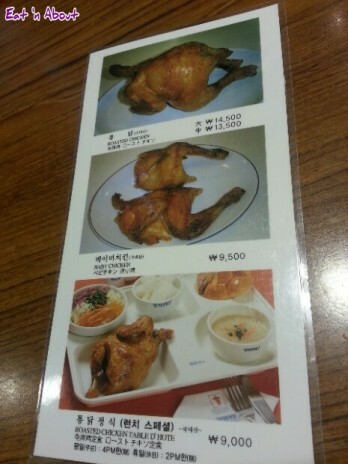 It’s been around since 1960s and they serve 2 things only- Ginseng Chicken Soup and Roast Chicken. As you can see their menu is only 2 pages long. Both are their specialties and are supposedly well-known. My eyes are always bigger than my stomach, so naturally I wanted to order both things. 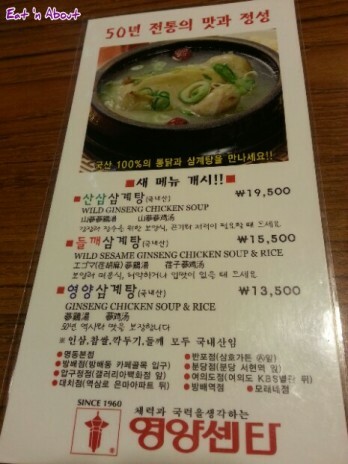 We decided on the Wild Sesame Ginseng Chicken Soup (15,500W) and a Roast Chicken. We wanted a baby chicken but we were told we could only order the medium (13,500W)….so we did. Both arrived very quickly. Only 2 banchan were served and they were different variations of radish…the white one is sweet and sour pickled and the red one is kimchi. Nothing special. 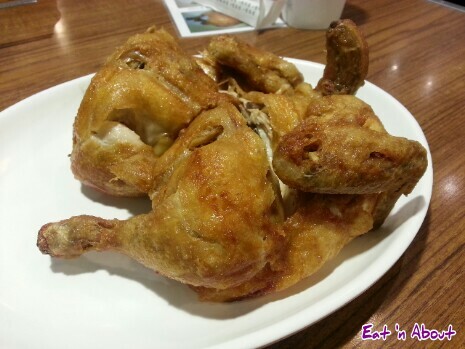 Roast chicken came first. I actually thought for a second that it was deep-fried because it was so crispy. The skin was very thin and it didn’t feel greasy. It was salted just right. I chose to eat the dark meat part first. It was definitely the better part as it was more moist. The white meat portion was very dry and tasteless, aside from the skin. I couldn’t finish it. All in all I’m not sure if the roast chicken is famous because it’s in the tour book, therefore leading to more people going to this place, making it famous, or that it really is due to the authenticity of the restaurant that got them into the book. I really wasn’t wow-ed much by this dish. As for the samgyetang, it came bubbling. The soup was noticeably thicker than the usual ginseng chicken soup. This was more like a congee. It was mild tasting but quite flavorful. The chicken however was of a drier texture, which I expected. I didn’t quite enjoy the chicken. What I did like though, was the glutineous rice within. Mouthfuls of the rice along with the thick potage really hit it home for me on this chilly first night in Seoul. 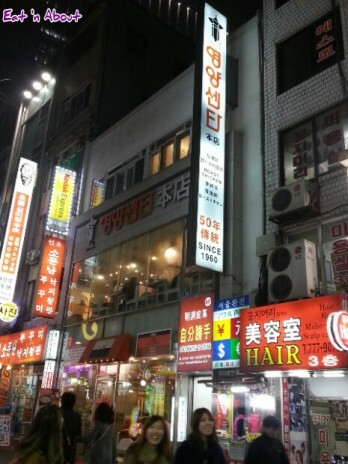 YeongYang Centre is located in Myeongdong near SPAO and Uniqlo.